Well, the Hell or High Water Rodeo has come and gone, and people are wondering how much was raised and where it is going. The day started out with the arena being very wet, with puddles everywhere – go figure, a rodeo for flood relief, so I guess Mother Nature wanted to remind everyone why we were all there! I pulled in early, and it was getting packed. I just had such a great feeling, seeing all those people offering support. Photo by Dana Zielke, Dynamic Photography. The rodeo performance began, and it was a very touching opening. Organizer Rod MacBeth spoke about victims of the flood, and all those affected. I could see tears in people’s eyes. As the rodeo commenced, it was definitely a fun filled day for everybody. The Farmers Market was on; there was plenty of involvement for the little kids with the mutton busting, wild pony races, and, overall, the whole energy and positivity of the rodeo; and everyone there was so helpful and kind. The Hell or High Water Rodeo raised over $100,000. Incredible. There are so many sponsors and volunteers who have made this happen, and are helping people’s lives come back together. The funds will be donated back to various people or causes. Hell or High Water Rodeo has already paid for two trauma bags that one of the volunteer fire halls lost during the emergency response, as well as a pair of skates and a hockey helmet which have been given to a 6-year-old. Kendra Edey competing in the barrel racing. Photo by Steve Dueck, Pride & Joy Photography. A big thank-you to the winners who donated their money back. Denny Phipps donated parts of his winnings back, Rick Quarrel’s Wild Horse race team donated their third place winnings back. Jim and Karry Kelts donated their pay back, and Aaron Ferguson donated his pay back. The generosity that people can have for others in times of need is amazing. Imagine what the world would be like if we could all be like that all the time. It would be an amazing shift for everybody. The aftermath of the floods that recently affected High River, Calgary, Millarville, Eden Valley and many more places, has left many with nothing. Loved ones were lost; there are no homes, no cars, no personal memorabilia, no jobs. Nothing. Those affected are slowly trying to piece their lives and community back together, and ongoing help is still needed. High River, Alberta is the one area that was hit the hardest by the ravaging flood. There have been plenty of volunteers, but this disaster and the devastation that goes along with it, is going to take a lot of time and dollars to restore back to habitable. Plenty of fundraising and benefits have taken place, but yet- There is one more that can really help out. Rod MacBeth, a rodeo announcer, has big plans. 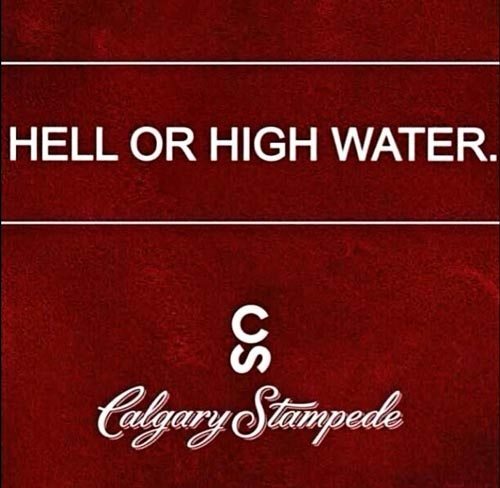 He has created the Hell or High Water Rodeo, to benefit flood victims of Alberta. 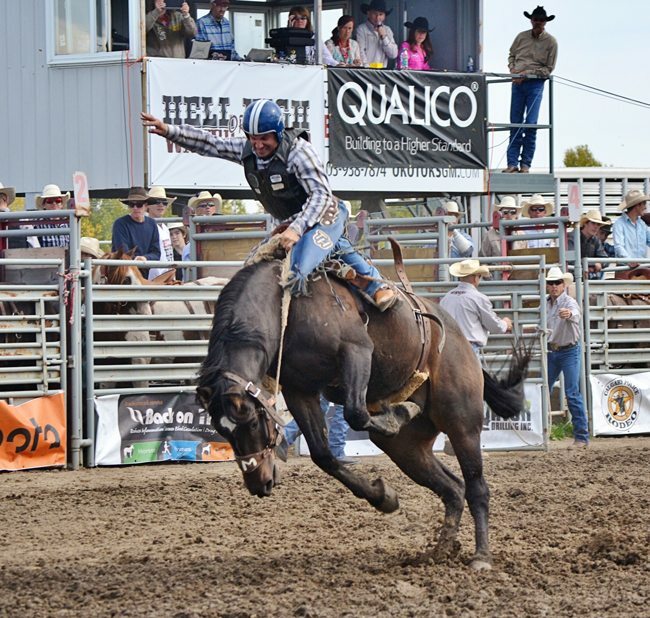 On September 21st and 22nd, commencing at 1:00 p.m., the rodeo is a two-day, family fun benefit, that will feature some of the best cowboys and cowgirls in the world. A typical day at the office for rodeo announcer, Rod MacBeth. One of the highlights of the two-day event is the Team Roping Jackpot hosted the morning of the 21st, for 30 teams of those that were affected by the flood. Amongst Rod are many others that are involved. I’ll be there too, competing in the barrel racing event. 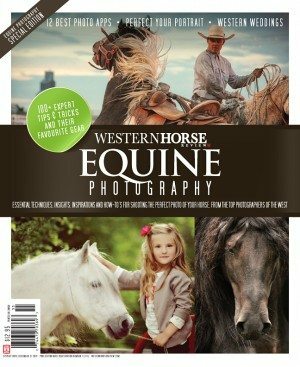 Oh, and we’re proud to announce, Katy Lucas, chosen as one of Western Horse Review’s Top 25 Under 25 this year, will be sharing the announcing duties with Rod. Also, special thanks to Kesler Rodeo and Maynerd Bird for providing the stock for the rodeo. For more information on the Hell or High Water Rodeo, you can visit their website, like them on Facebook, or follow their Twitter feed. So put those dates on your calendar, do a good deed, and come out to support! 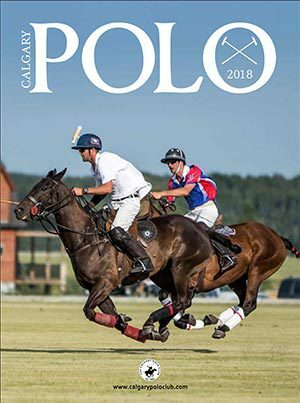 The southern Alberta floods which began Thursday morning have left many horsepeople, livestock and pets stranded, and/or in need of assistance. To date, over 70,000 people in the city of Calgary have been evacuated and nearly 20 outlying communities from Red Deer south to Lethbridge have, or are on the verge of calling a state of emergency. Many of the affected are rural people, caring for livestock and pets. Many are without internet, or landline phone service. Without these essential tools of communication it’s hard to know who even needs help right now. 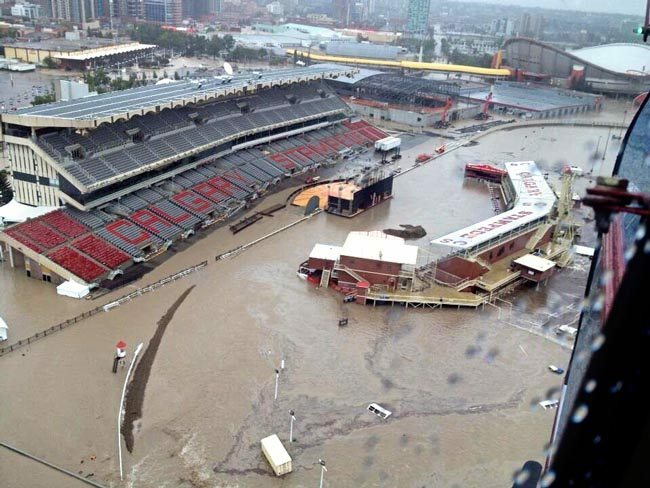 This photo of the Calgary Stampede grounds was posted on CBC reporter, Cameron MacIntosh’s twitter feed Friday morning. Understandably, this is a great concern the Stampede, scheduled to kick off in two weeks time, will not proceed as scheduled, however the organization’s twitter feed released the following message Friday afternoon: “Our volunteer and employee teams will be working hard to create and deliver the Calgary Stampede on July 5-14 as scheduled.” Perhaps, as some have commented on the Western Horse Review Facebook page, the community needs to rally around an event such as the Stampede now, more than ever. An update to Friday’s note: yesterday the Calgary Stampede released this image in response to the many concerns and rumors of the viability of the show proceeding in less than two weeks. Love the cowboy-up attitude and fantastic to see folks rallying around it. • Updates on the Calgary Stampede situation can be found here. The information below is what we’ve gathered throughout the day and addresses areas of need, relief and horse show and rodeo cancellations and announcements. I’ll update this list as information flows in. • Find family members affected by the flooding in Alberta at the Red Cross Safe and Well site. • Check the High River Flood Support Facebook Page for ways to contribute and the latest news. • The Alberta Animal Rescue Crew Society has set up a hotline for southern Alberta residents who are being evacuated and in need of temporary housing for pets. Please contact AARCS at (403) 250-7377 during business hours or (403) 869-4694 after hours. • The Canadian Standardbred Network is doing an organized feed and supply collection with three main collections sites: south of Edmonton, northeast of Calgary and southeast of Calgary. See the full poster at the WHR Facebook page, and share it. E-mail feedfortheflood@gmail.com for more info and to donate. • Cowboy Country Western Store, near the hub of the disaster has been collecting goods and clothes all day. Stop in or check their Facebook page for ways to contribute. • Equine Care and Keep is accepting emergency placements of horses and can accommodate up to 10 head. For those within 75 kilometers of Water Valley, proprietor, Sandy Avery is offering complimentary transport and care. If you need emergency placement contact Sandy directly at (403) 510-8324. • The Cochrane Ag Society is offering up their barn for housing any animals needing emergency shelter. Water on site, but no feed. Call (403) 973-3250. • The Equi-Health Canada Home Ranch, Higher Trails is accepting emergency placements of horses/trailers. They are on high ground off Highway 7 between Okotoks and Black Diamond and can accommodate up to 30 head. For emergency placement of horses contact (403) 700-9152. 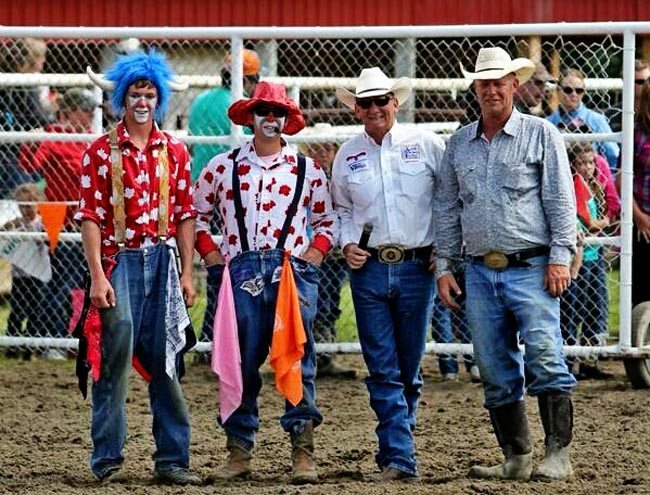 • The Bowden AG Society has offered to open up the rodeo and camp grounds for people displaced by the flooding and they have opened the showers and bathrooms. Call (403) 507-7664. • The Didsbury Ag Society is offering free stabling for anyone in need. Must supply own shavings, and strip stall when finished. Contact 403-335-3642 for access to stables. 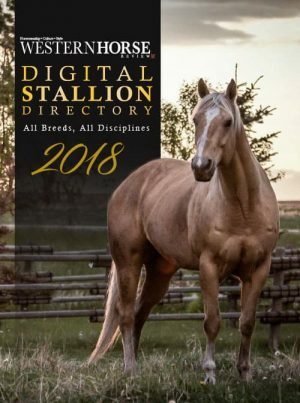 • Alberta Stables Directory has three separate Events created on their Facebook page which are currently receiving many offers of horse and pet housing. Many are also offering to trailer to distressed areas and haul horses out if necessary. • The Alberta Reined Cow Horse Association has many offers of board and housing up on their Facebook page. • A few of the personal offers: Vickie Chubocha, near Calmar has round bales she would donate for anyone who wishes to come and pick them up. Call her directly at 780-985-7203 or cell 780-977-0342. Janis is east of Innisfail and offers up a couple of stalls, paddocks, extra bedroom and a travel trailer that sleeps 8. Call her at (403) 227-1019. Several others sent me notes of pastures, paddocks and stalls – message me directly if you need to place your horses. • Tudor Tack in Edmonton, Alberta is offering to donate all the GST of sales tomorrow (June 22) to feed for the flood. As well, they have a donation box set up. • The Calgary Humane Society earlier reported they were looking for large dog kennels or crates – their Facebook page now reports they have received enough. They are also welcoming any animals which need emergency boarding. Their address is 4455 110th Ave SE, Calgary. • Neighbour Link Calgary reported this morning they are collecting supplies to take out to the Siksika Nation, which has been hit hard with flooding. See their Facebook page and Twitter feed for more information. • In Calgary, if you want to help, If you want to help, follo /use the hashtag #yychelps and sign up at http://www.yychelps.ca. • Donate to @redcrosscanada Calgary flood relief either online http://www.redcross.ca/who-we-are/red-cross-stories/2013/red-cross-responding-to-alberta-flooding … or txt REDCROSS to 30333 and donate $5.00. A special call-out of thanks to the local Hutterite colonies who have been cooking non-stop, and calling in supplied from nearby colonies. Be sure to say thank-you to the true neighbours we have in the colonies. 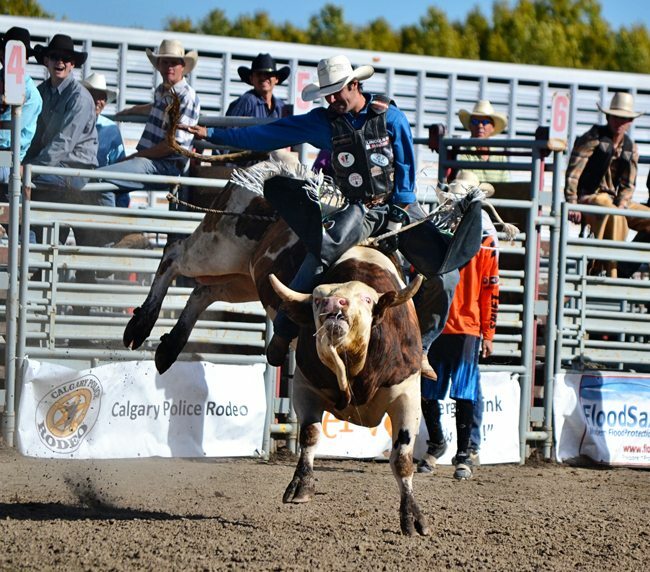 • The Sundre Rodeo, scheduled for this weekend, has been cancelled. 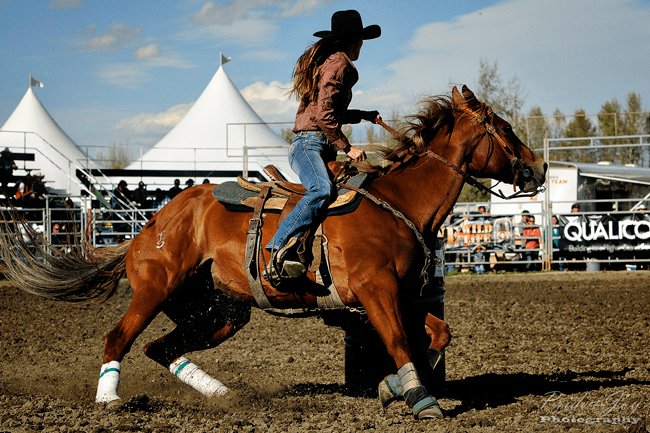 • The Alberta Reined Cow Horse Association Stock Horse Show in Claresholm this weekend, June 21 – 23, has been cancelled. 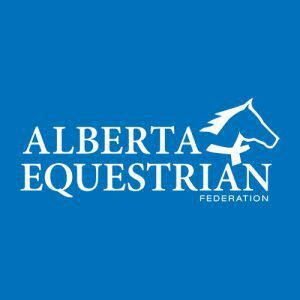 Claresholm has offered the association the use of their arena next week so the new show dates will be June 28 – 30. Competitors must re-enter for the June-30 show. The power of community in times of disaster is truly amazing and there are many heartwarming stories emerging already. Feel free to e-mail me directly at ingrids@efirehose.net with updates and news you may have, and I’ll continue to update this list.